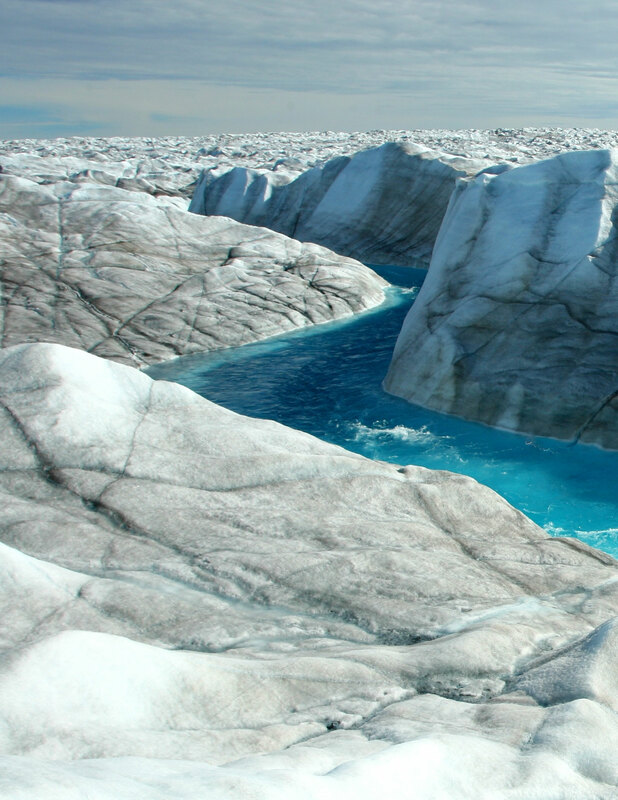 A newly published study from the University of Edinburgh shows that the movement of the southwest portion of the Greenland Ice Sheet that terminates on land has been slowing down despite decades of increasing temperatures and surface melting. Researchers derived their results by tracking ice sheet movement through Landsat satellite images taken from 1985 to 2014 across a roughly 3,088-square-mile (8000-square-kilometer) region in southwest Greenland. They found that, between 2007 and 2014, ice movement slowed in 84 percent of the study area, during a period of high surface melt, compared to the years between 1985 and 1994. The average slowdown was 12 percent, or 32.8 feet (10 meters) per year. The finding is contrary to the widely held view that a greater amount of surface melting will result in faster-moving ice sheets, as the movement of both ocean- and land-terminating ice sheets is caused in part by surface meltwater, which makes its way to the bedrock through openings in the ice and acts as a lubricant. The amount of meltwater draining from the ice sheet in four out of the five years between 2007 and 2012 has been the most substantial of the last 50 years. 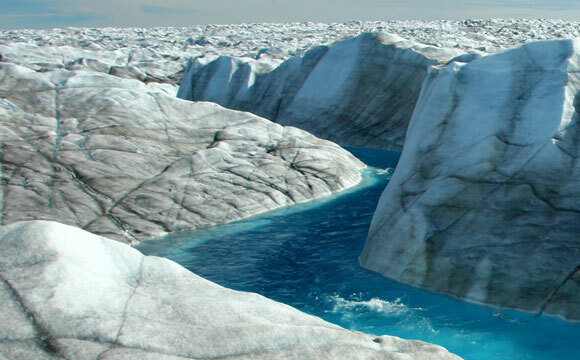 Researchers found that while the larger summertime meltwater volume of recent years has led to greater lubrication of the ice sheet base, speeding up its flow as expected, by the end of summer the meltwater has also established channels at the base that act as efficient drainage systems to lessen the water under the ice sheet, slowing it down by winter. “This suggests that further increases in melting will not cause these land-terminating margins of the ice sheet to speed up,” said lead author Andrew Tedstone, a glaciologist at the University of Edinburgh, Scotland. While these results may be viewed as good news for the Greenland ice sheet, they are offset by the fact that it is not the change in movement of the land- but rather the ocean-terminating portion of the ice sheet that is contributing to sea level rise. “The ongoing acceleration of both glacier surface melt volumes and the ice motion of ocean-terminating glaciers ensures that Greenland’s contribution to sea level rise will likely increase in our warming world,” said co-author Peter Nienow, University of Edinburgh. The Greenland Ice Sheet is the second largest mass of ice on Earth, containing enough water that if it all melted, ocean levels would rise by about 20 feet. Greenland has shed on average 303 gigatons of ice per year since 2004, and with every successive year the loss has increased by 31 gigatons. (Each gigaton equals one billion metric tons.) Recent estimates suggest that surface melting is responsible for 60 percent of Greenland’s ice sheet losses, while the remainder is caused by ice sheet discharge into the ocean. NASA and the United States Geological Survey have already begun work on Landsat 9 to help continue this record. Be the first to comment on "New Research Shows Greenland Ice Sheet Movement is Decreasing Despite Warming"